I’ve never been one to blow through my paycheck on a shopping spree. I do buy clothes more often than my husband but not nearly as often as most women. I never buy jewelry. I don’t have a lot of knickknacks or art, although, with a mother who is an artist, I certainly appreciate great artistic talent. I don’t care about TVs, home theatres, or electronics gadgets. I am only occasionally tempted by purses or things with multiple pockets and compartments (and the bigger the better). Really, the only item in existence that is a potential budget buster for this girl is a book. I often avoid bookstores if I don’t have extra spending money because the temptation to buy is so great. At the end of 2012, I wrote a post about the books I hoped to read this year. Of course, I haven’t yet been able to read nearly as much as I hoped, but I’ve already gone through several that I adore and can see myself going back to again and again (including one title that was at the book fair, Erin Morgenstern’s The Night Circus ). But within days of publishing that list, what do you think I did? I went out and bought more books. 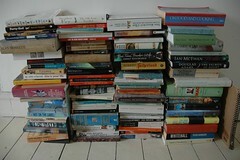 Now, I know there’s no way in the world that I’ll be able to read all of those books this year. I suppose I could shut myself in my room with a box of tissues (just in case), but it’s not like I have a maid to take care of the house, a nanny to watch my kids, or a trust fund to pay for it all. Why do I keep plaguing myself with these books? Why can’t I stop? There are much more harmful vices, I know, but even if I’m not destroying my relationships or running up credit card debt with my habit, I’m certainly running out of places to put each new purchase. I converted my china cabinet into a bookcase, and now I’ve taken over most of the top of my spinet piano, as well. Whenever I want to have fun and internet browse for my dream home, houses with built-in bookshelves automatically jump to the top of my list. Part of me wonders why I never became a librarian. I didn’t want to spend any more time in college than I absolutely had to, however, so forget the master’s in library science. But I could still work in a school library somewhere. Whenever I volunteer in my son’s school’s media center, I bask in the atmosphere of so many well-loved published works. And since I went to school there, too, and received much joy browsing those shelves as a girl, it’s even more of a magical experience. I listen in wonder as kids come in, excited to find a new book, and the media specialist rattles off titles that she thinks will interest boys and girls of all different ages. She’s my hero. My husband has always been a great gift giver. At birthdays and Christmas, he’ll ask what I want, and often I list a number of books that I’d like or say, “You know what I like to read. Just surprise me.” He’s responsible for many of the tomes that crowd our shelves and spill over into the rest of our house, including the Harry Potter, Artemis Fowl, and The Hunger Games series. He discovered early on that I couldn’t care less about jewelry, perfumes, flowers, spa days—in other words, things that would delight most other women. The first gift he ever bought for me (and the only piece of jewelry he’s given me, except for the wedding rings we exchanged) was a watch. I’d been going on for a while about how I needed a new one, and I still wear it today, almost fourteen years later. My mom jokes that it’s my engagement watch. But what she forgets is that Thomas followed the watch with a book, The Girl Who Loved Tom Gordon , by one of my favorite authors, Stephen King. I think I know which gift really won my heart. This entry was posted in About the Writer Mom and tagged Artemis Fowl, Books, Erin Morgenstern, Harry Potter, Reading, Scholastic Book Fair, Stephen King, The Hunger Games, The Night Circus. I remember many birthdays for you was shopping a my school’s book fairs. Maybe one day I’ll read one of our stories there! I spent more on books than on anything else too!